Railroad watches are probably one of the most active niche's of watch collecting with lots of passionate collectors out there. I find it kind of odd really, as they tend to all look alike to me. But there are loads of different dials, different hands, and different cases to collect... so there is quite a variety of options to choose from. The need for Railroad Watches to be "railroad approved" stemmed from a train accident in the late 1800's where two trains collided due to poor time keeping. Consistent time keeping was the only thing that kept trains from running into each other. So a standard was developed to define what types of watches could be used. Over time the standard evolved to dictate a minimum number of jewels and the use of a "micro-regulator" - a spring loaded device that allows the regulator on the balance to be secured and set to a fine degree with a screw driver. Watches also had to be regularly serviced and certified to keep time appropriately. I started out collecting pocket watches but moved on to wrist watches, as I could enjoy them a lot more by wearing them every day. But I still have a soft spot for a nice pocket watch (or even not-so-nice ones too). 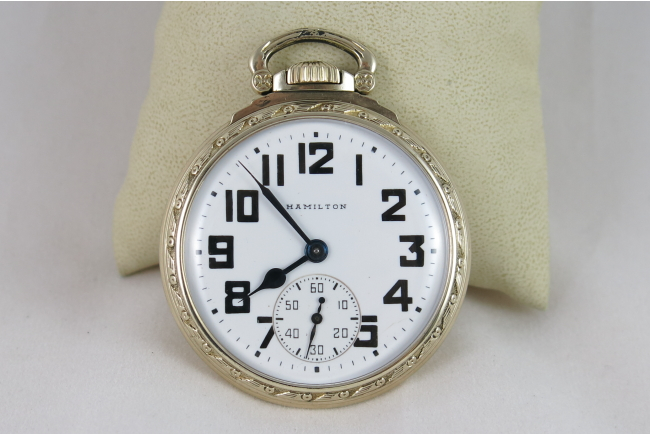 I recently picked up one of Hamilton's finest railroad watches - a 21 jewel, 16 size 992B. Based on the 1948 catalogs I would identify it as a Model No. 11, with a single sunk HG (heavy gothic) dial. It's the case on the left with the dial on the right in the catalog snip below. I got it for a good price as it had a broken mainspring and wouldn't run. It was also very dirty, but the case was in great shape. 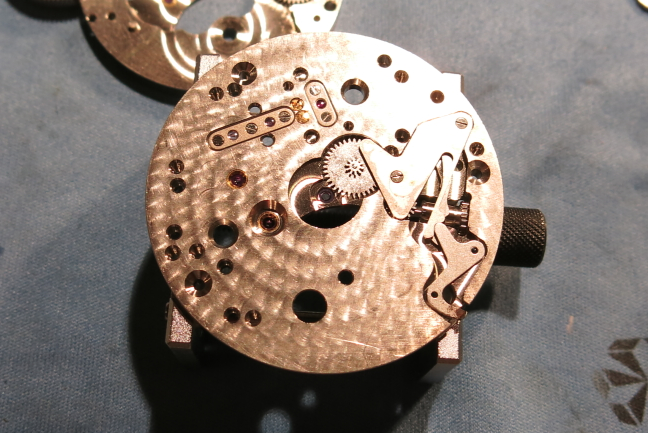 The 992B was introduced in the late 1930's and replaced the 992 movement which was used for the prior decades. There's also a 992E - which was created in 1934 when the Elinvar hairspring was introduced. The 992B continued to be made through the 1960's. I can tell by the serial number that this watch was made in 1948. Pocket watches are fun challenges to work on. They're bigger so that's actually a nice change from the tiny parts in wrist watches but the setting mechanism and some of the other pocket watch-specific parts can be unfamiliar and a little puzzling. 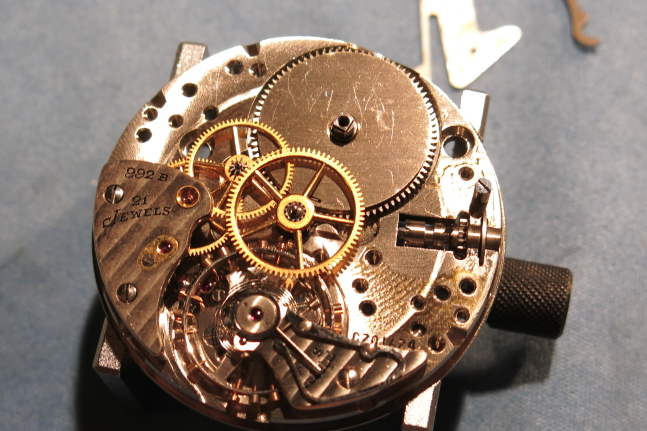 As with all overhauls, the first thing to do is to get the movement out of the case. In the shot below the front bezel has been removed. The 992B is a "lever set" watch - so you pull out a lever to set the time. This is different than a "pendant set" watch where you pull the crown and stem to set the time. You can see below that I pulled the level out (near the 1) to show you this is now in "time setting" mode"
Flipping the watch over, you can see the 992B is a nice looking movement with attractive damascening. Two case screws hold the movement in the center case. You can see them on opposing sides of the movement circumference. Once they're removed the movement will come out the front of the case. Here's the movement safely secured in the movement holder. 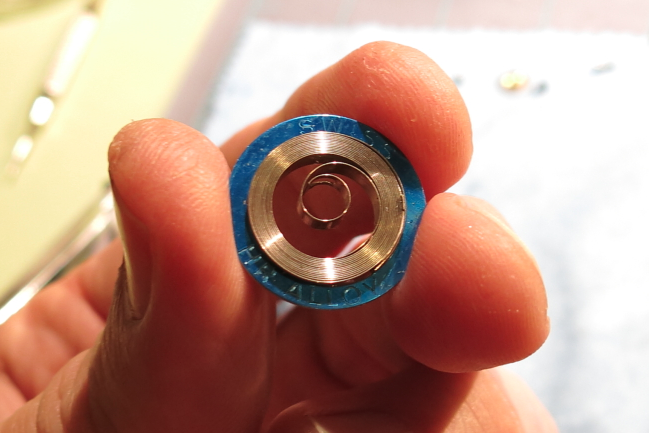 Since the mainspring is broken there is no need to release any remaining tension in the barrel. If it was not broken this would be the time to make sure there was no stored energy in the watch - as these mainsprings can pack a wallop. Three dial foot screws hold the dial on. With the dial and hands removed you can see this looks a lot like a giant wrist watch movement. The main difference is the "keyless works" used to wind the watch and set the time. The set lever has been removed in the shot below... you'll see it again later. First off is the hour wheel and cannon pinion. Here the parts of the keyless works have been removed. There's a very strong spring in there that surprised me when it shot out of the movement. Fortunately I was able to find it after a few minutes of panicked searching. The cap jewels on the left side will come off next. 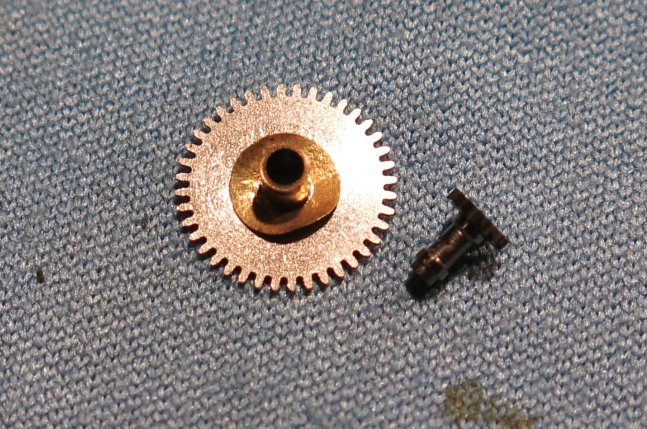 You can see the escape wheel's cap jewel is held with two screws and the pallet fork and balance wheel's cap jewels are held with three screws. Flipping back to the reverse of the movement, the Ratchet wheel and screw can be removed, then the three screws for the "barrel bridge" are removed so the bridge can be taken off. With the barrel bridge gone you can see the mainspring barrel, center wheel and third wheel are now exposed. Two screws hold the "train bridge" on and with that removed the fourth wheel and escape wheel are now exposed. That leaves the one screw for the balance bridge and then the balance can come off too. The only thing left on the back is the pallet fork and it's held in place with it's bridge. Two screws hold it on. You can see there is a lot of oil near the serial number... I see this a lot but I'm not really sure what it's from. I can get pretty gummy. Here's a close up of the pallet fork. It's sometimes called an "anchor, for obvious reasons. There are two jewels called "pallet stones" on the ends. The engage the escape wheel and generate the tick tick tick noise you hear. 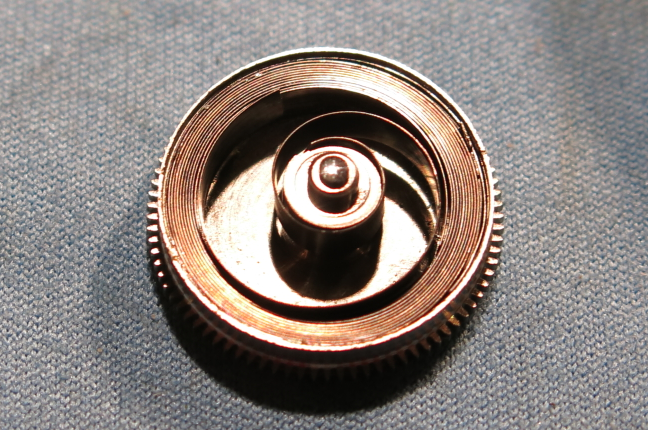 I'll install this new white-alloy mainspring once the barrel is cleaned up. Fortunately this spring came in the a holder that keeps it wound tight. I'll get one chance to install it right, otherwise I'll have to wind it again using my mainspring winder. I've done these by hand before too - it' s very challenging as these springs are super strong. 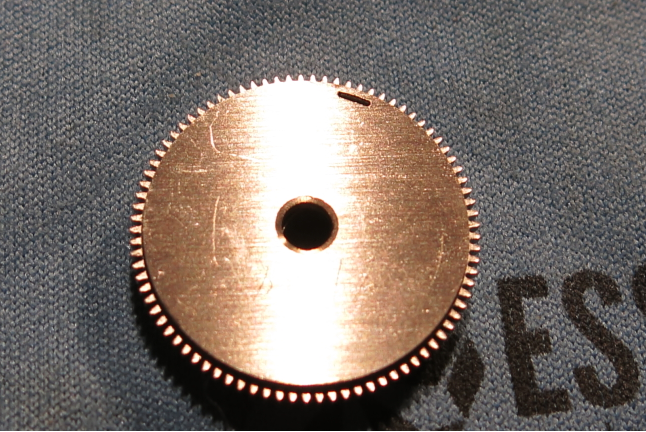 Here's the mainspring next to the empty barrel. The barrel has a little slot for the "T-end" of the spring. This catches the spring on one end and the other end is caught by the arbor in the center - that allows the watch to wind and store energy. If either end slips the energy would be lost. In this shot the spring is installed and the T-end is in it's slot. Here, I've got the arbor installed... that can be tricky too. 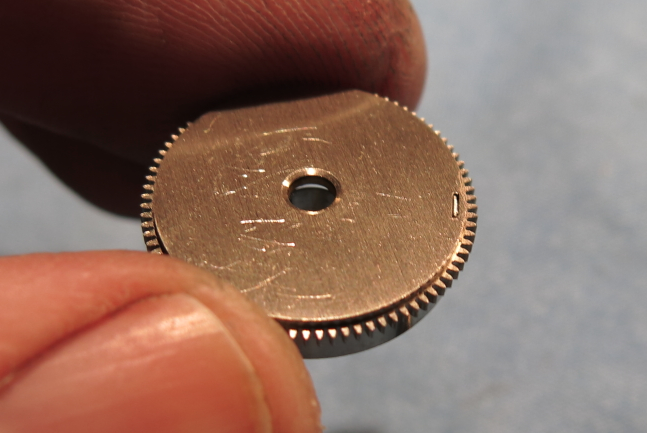 I'll apply a little mainspring grease to the spring before I close it up with it's cover. Everything is now cleaned and drying. It's time for a little assembly. It goes back together in the reverse order that it came apart - except I'll put the balance assembly on last. You can see the little spring I lost in the top center of the parts... looks like a fish hook. Everything goes back onto the front... the cap jewels and the keyless works. You can see the set lever has also been reinstalled. Now you can see how it works... you slide it out and it will push the lever that will move the watch into the time-setting mode (right now it's in winding mode). Next, the pallet fork in reinstalled. The escape wheel and the fourth wheel (that the second hand is attached to) go in next and are held in place with the train bridge. Now the barrel, third wheel and center wheel go back in and are covered by the barrel bridge. 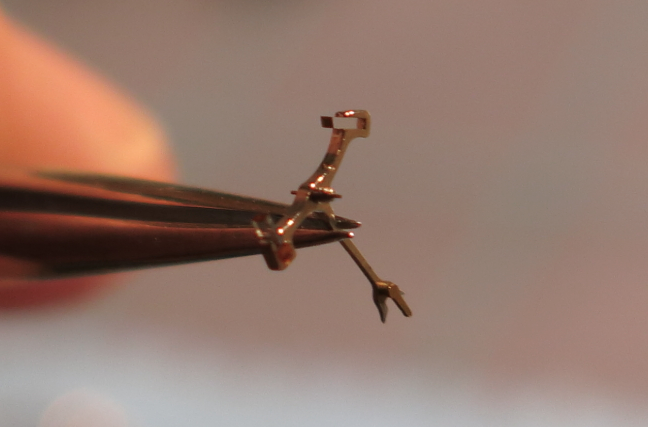 Last on is the balance assembly - and with a little mainspring tension this watch is brought back to life. Running 5 seconds fast per day... not too shabby! 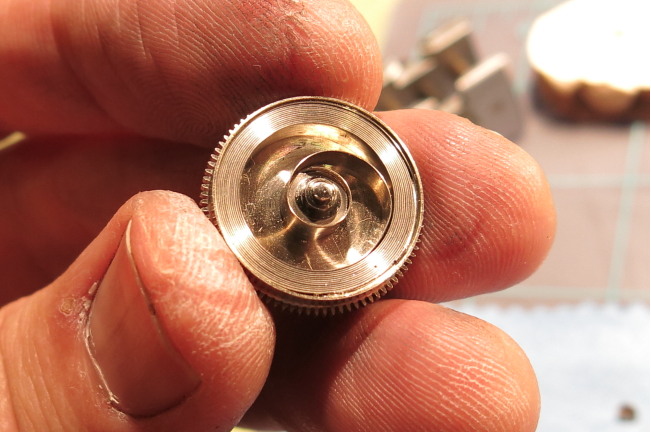 The cannon pinion and hour wheel go back on and this watch is ready for it's dial and hands. And here it is, all polished up and looking like a new watch! This watch is a real "thing of beauty". I have a 992B mfgd. in 1943. How much will it reasonably cost to replace the broken main spring? 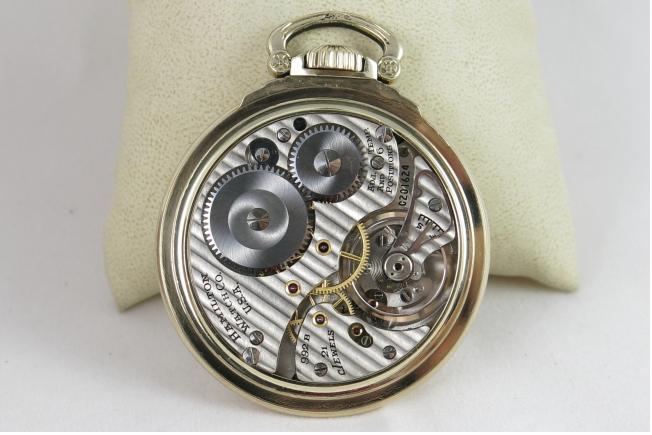 The repair facilities in the Phoenix area all quote $250 and include a complete overhaul of the entire watch. None will just replace the spring. Thanks for your help. Wow! $250 is a lot I think. A new mainspring will run you probably $30 - $50. An overhaul is not a bad idea if it hasn't been done in the last 5 years. It should run you about $65 - $75 - plus return shipping. So I would say $125 tops would be what you should pay. If you need a recommendation on where to send it you can email me. Look up at the top right where it says "Contact me click here"
OK, reading this article was absolutely fascinating but completely convinced me that in no way, shape, or form am I capable of replacing the "hairspring" on my father's 1947 17-jewel Hamilton pocket watch! 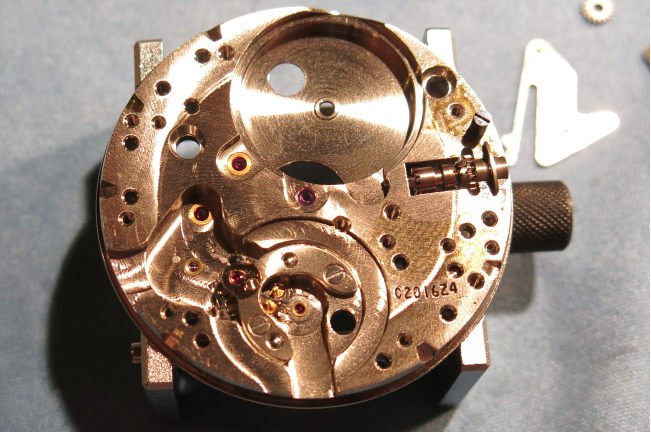 Probably not - first, you'd need a staking set to properly reinstall the hair spring but second (and more importantly) the length of the new hairspring needs to be matched to the mass of the balance wheel by "vibrating" it - and that requires even more specialized tools. The watch is from 1953. If it was my grandparent's watch it would be "priceless". That said, you can check ebay for completed auctions of 992B's to assess the market rate. I understand that and am trying to get it for myself but of course the other people want it sold. go figure and thank you for your input. Cool site! Thank you for sharing your passion. HandyDan, I am unable to locate a link to contact you. 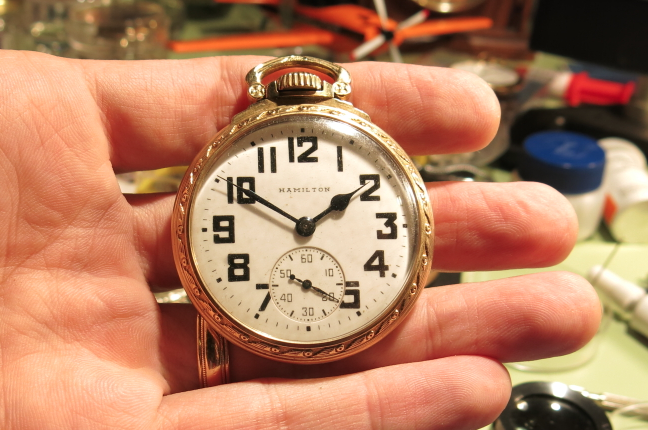 I have a Hamilton Railway Special 992b model 11 appx. a 1945 model. HandyDan, the link wants me to install a etsy app and it locked me up. I will continue to try and contact you. I see on eBay that running watches start about $350 for what I am looking for. Of course I may just be ending up with another problem watch! Hi Everyone. With all due respect, I think $200 - $250 for a complete overhaul could be reasonable to overhaul a watch, depending on the service performed. 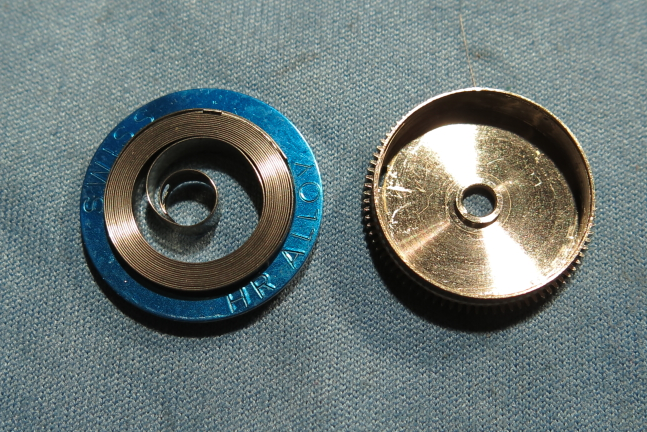 A complete overhaul usually includes a new mainspring ($25-50 with shipping,) and is always taken completely down, cleaned - most likely by ultrasonic cleaner - inspected, timed, and greased and oiled in all the right places. There are many, many hacks out there who would open the back case and spray it down with WD-40 and STILL charge you that $65.00. You get what you pay for. I don't know any watchmaker (I am in training) who would take less than three to four aggregate hours in total dealing with your watch servicing. 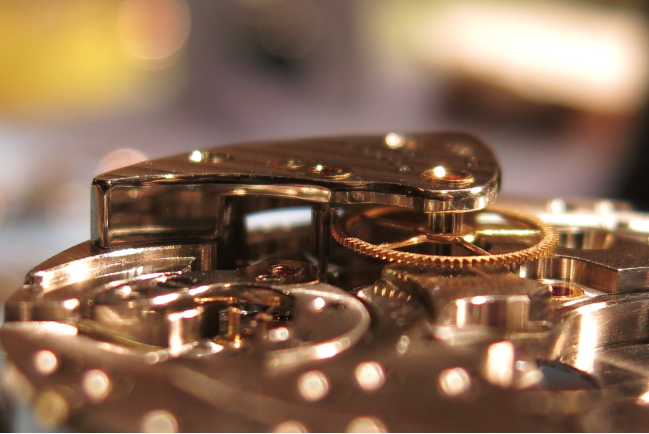 Keep in mind that most watch makers only work on one watch at a time, and cleaning and drying, as well as proper inspection and handling ALL takes time. In 1980, there were 30,000 watchmakers. Today, there are less than 5,000. So, while the watchmaker may have clocks to service in between the time it takes for a machine to clean and dry your watch and parts, suffice it to say that there is A LOT of time spent in the care and handling of your watch. Oil something in the wrong place, or put too much (I'm talking miniscule amounts here, that require heavy lighting and magnification)? Be prepared to service that watch maybe 50% sooner than you would have, if it was done correctly. 65 bucks won't get you much at all in the way of quality, and no, I wouldn't replace a mainspring without overhauling the timepiece either - and it's NOT because of money or anything. Shortcuts on these beautifully put-together time pieces are a disservice to the watch AND the customer - again, you get what you pay for! I'd be very comfortable charging a solid $150 to do a watch that included a mainspring, but $65? No way, I'd be making maybe ten bucks an hour, and while watchmaking is a passionate endeavor for many of us, selling ourselves short is not only wrong in the sense that we're not being fairly compensated, but come on folks, what do you think plumbers or electricians would be charging if there were only 5,000 of them? We are proud technicians - and not the overblown kind...we are genuinely proud to say that we do good work that hardly anyone do that's worth a darn. Also, remember this: watchmakers very often have to make their own parts because of a total lack of them on the open market. I would readily admit to not being able to do that at my stage of training and exposure, but I know several guys who can, and do, and MUST because there are no parts. These guys are nothing short of artists in their own right. So, in closing, I do not post this to argue or prove to anyone that they're wrong and I'm right, I'm just trying to interject a little knowledge from the other side of the counter. 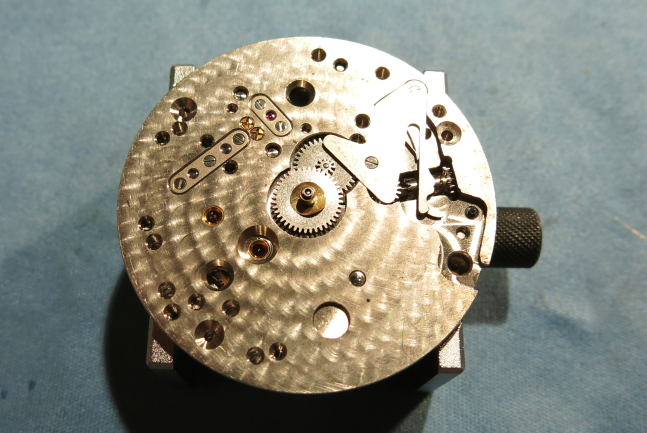 Even though he doesn't talk about watches, check this webpage out for a good friend of mine, Paul, who explains why he won't overhaul a clock for 40 British Pounds. Paul has the heart of a teacher, and if you read it, you may also understand why this line of work is so special, in demand, and yes - worth the money! 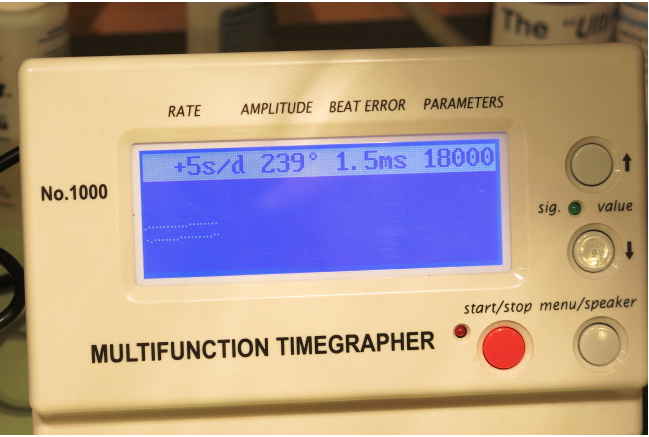 Here's the link, and I'm sorry if I'm not supposed to do that here: https://clockrepairs1969.wordpress.com/why-i-wont-be-servicing-your-clock-for-40-how-to-service-a-smiths-clock/ Also, sorry for choosing the Anonymous button, I couldn't log into my Google account because we're having power outages and I wanted to get this out. My name is Tim. :) Take care everyone! Thanks for your well thought out post. It’s an interesting economic case study, really. How much should an overhaul cost? There is no easy answer. Like most things, the likely answer is “it depends”. I agree $65 - $75 is on the low end, but I know established watchmakers with low overhead that charge that amount for a basic overhaul. The key terms are “low overhead” and “basic overhaul”. Additional parts or service work is extra. Pocket watches are not complicated... in fact beginner courses usually use a pocket watch movement to teach the basics to new students. 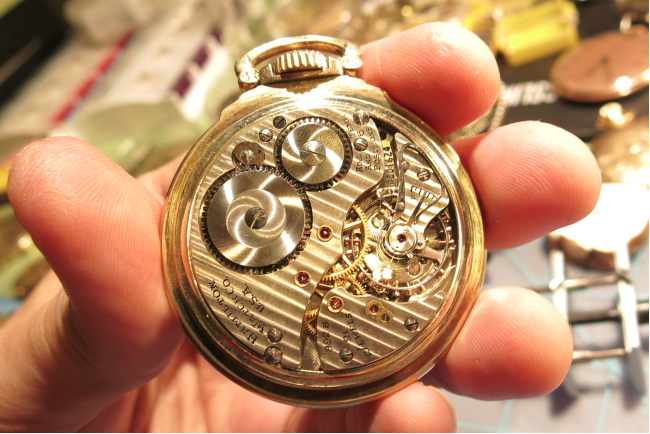 If everything is in good order, it takes no more than an hour for a competent watchmaker to tear down, clean, dry and reassemble a pocket watch. Material costs are insignificant so only overhead and labor are really at play. 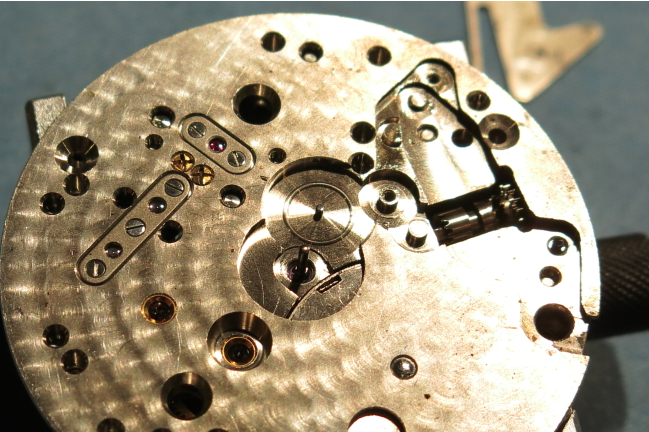 Post-1950 watches usually have a "lifetime mainspring". Replacing an otherwise good white alloy mainspring just "because that’s what I do" is a debatable process. I can understand how it could be a prerequisite for offering a 1 year warranty though. It’s been my experience that fine watches (like Hamilton) are more often than not just in need of a thorough cleaning. 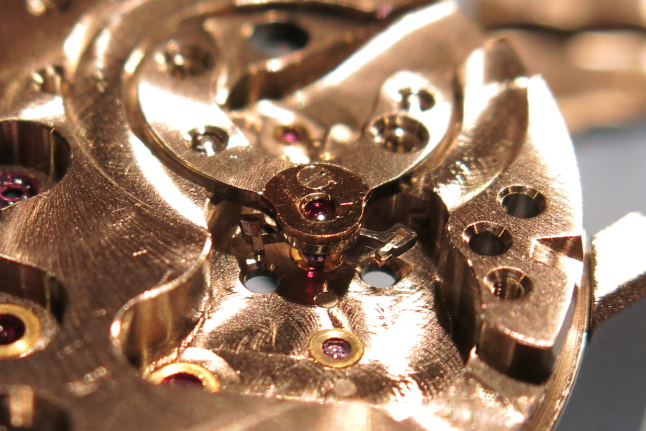 However, older watches (pre-1940) that are non-runners often need additional work like polishing pivots, replacing mainsprings, or replacing a cracked jewel. Not to mention fitting a new crystal or other case-related work. That all adds up quickly and is beyond what a basic overhaul requires. So let’s say you have grandpa's 1949 992B that's not running. It's very dear to you and you’d like to get it running again. So you send it to a watchmaker for an estimate. It could require just a good cleaning - $75 and possibly a new mainspring $35 - that's $110 on the low end. But if it needs a new balance staff - $75 and the train wheel pivots polished due to corrosion - $75, that could add another $150. Now add a new crystal - $30 and you're up to $290 or thereabouts. You can buy a nice 992B on eBay any day of the week for less than $290. So you’d be investing more to restore the watch than it’s worth. But it’s an heirloom, after all. I don’t disagree that there are some very talented watchmakers out there who can make ALL of their own parts, hands, dials, etc. They truly are artisans and their skills are unique and valuable. But those aren’t the skills needed to overhaul a watch. A surgeon may make $1,000 an hour in a hospital but you wouldn't pay a surgeon $1,000 to mow your lawn. It's the complexity of the job that dictates the costs, not the skills of the laborer. 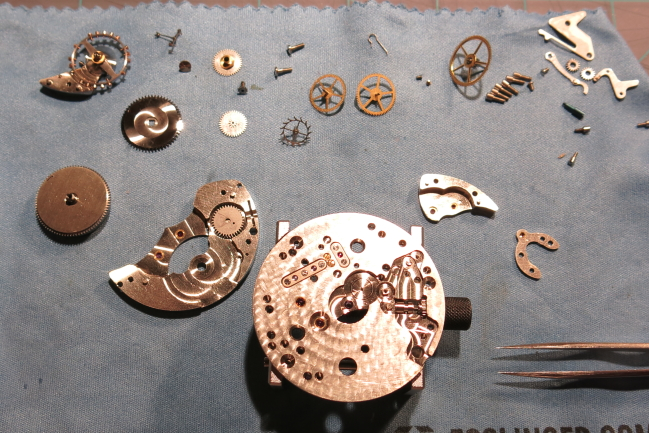 Any watchmaker charges $250 for a straightforward overhaul should assess the basis for their rate. If they can charge that amount and stay busy, then more power to them. That’s price elasticity at work. However if they’re not busy then that’s a problem. Do their rate include a lot of overhead? Could they reduce their overhead and charge less? 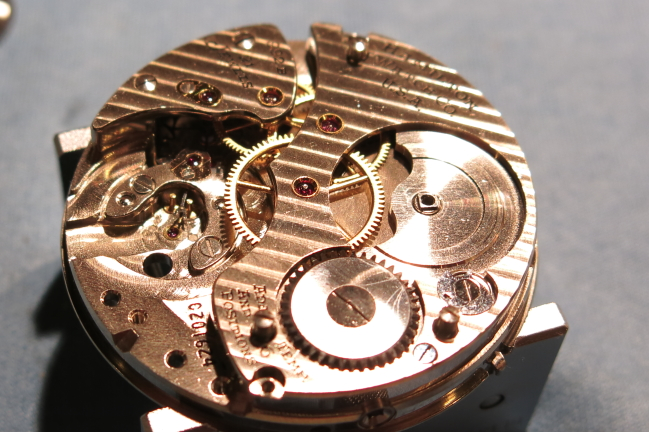 Modern watch companies require their “certified” watchmakers to have specific equipment, shop conditions, etc. and those requirements are VERY costly. If you aren’t “certified” you can’t buy parts. Seems unfair and perhaps unlawful but that’s the predicament today’s watchmakers are in. Those additional costs need to be passed on to customers. So if you buy a Rolex (et al) factor that into why your service cost is so high. 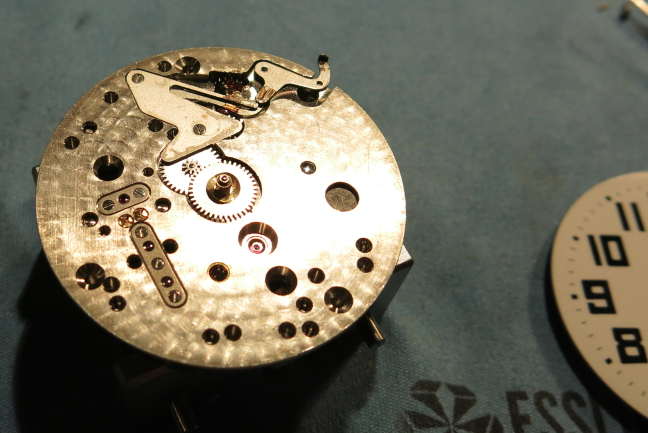 In addition, when watches have additional complications they require additional skill and customers should expect to pay more for an overhaul. Chronographs are probably the most complex and a service cost of $300- $350 isn't unrealistic. I recently saw a 1950’s memo from Hamilton to its customers that said Hamilton charged approximately $2.50 to overhaul a watch. in 2014 dollars that would equate to $50 or so. Parts were extra, of course. So how much should an overhaul cost? 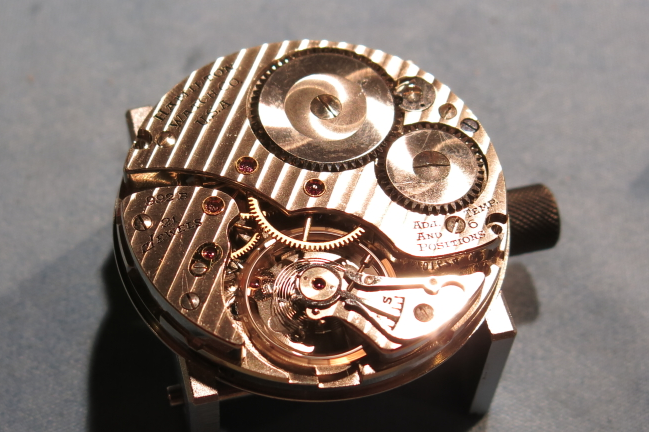 My advice would be to find a watchmaker that does good work at a rate you think is reasonable and stick with them. Thank you, Dan. Also, thank you for the info about the dial. I believe it's enamel. I'm so cautious about cleaning it - and yet, I want to make a favorable improvement. It's not cracked at all - and definitely not paper...I had some questions answered in another forum that helped, too. You provided some interesting counterpoints, many of which I wholeheartedly agreed with...not that that is the goal, I mean a debate is a debate, where viewpoints should be exchanged in good faith, and respected, and I certainly respect yours. In my short timeframe, I've yet to see a spring that wasn't set. Another watchmaker (a fully vetted one) did disagree, saying he had never seen a "lifetime" spring that wasn't set in some way. 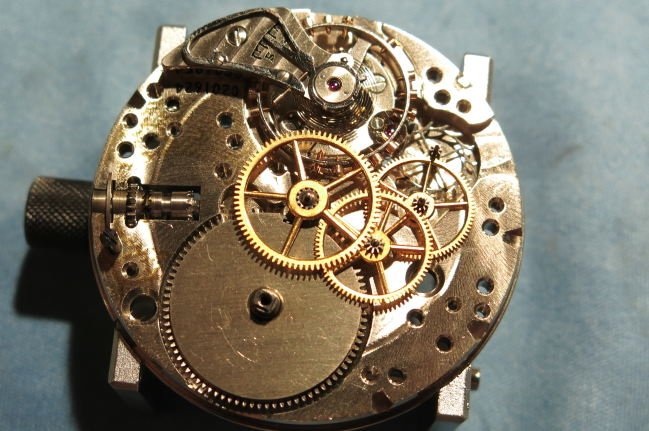 Others also disagreed with your "One hour servicing," but they also made note that many watchmakers will do little extras to avoid further problems down the road. They were saying that one hour seemed to be quite quick, to disassemble, clean, dry, and reassemble and get out to the customer. I'd have to agree...but again, your opinion is as valid because you have your own experiences. 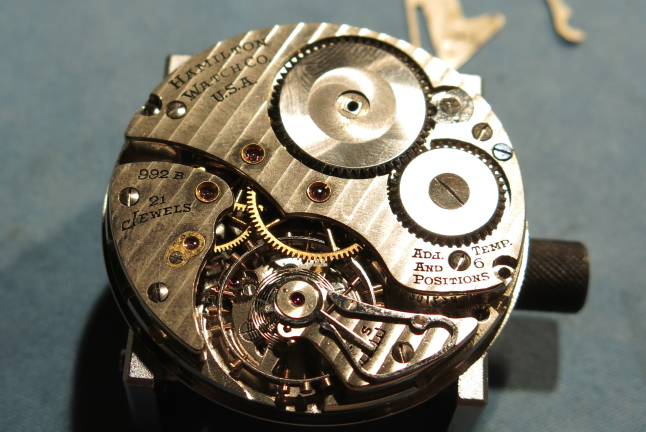 I believe it boils down to preferences and little habits each watchmaker exhibits over time. Whether learned or instructed by another, we all have our various reasoning as to why we do what we do. Again, thank you Dan, this little exchange is very much appreciated. I'm sure there is a broad array of opinions on the subject and I don't do watches for a living so I'm surely not as passionate as professional watchmakers. A rate of $75 for a basic COA may be as unrealistically low as a rate of $300 is unrealistically high. You could make a similar argument for barbers... how much should a haircut cost? The Lititiz Watch Technicum has some great videos on watchmaking and you can see why certain activities can be very challenging. They have a specific video on a "Hand Wound Service Procedure" and it's very thorough. It's only 43 minutes long. So as long as everything goes smoothly, it doesn't take too long. And if anything doesn't go smoothly, then that's something that should cost "extra". The challenge is a lot of watchmakers have to work off of a rate card and pick a value to cover the basic service. Like Jiffy-Lube... how much does an oil change cost? It's the same for certain sized engines... but if you can't the the oil filter off easily it could take a lot longer than expected. But they also "inspect" for other things that can earn them more money... brakes, hoses, belts, etc. Would you mind telling me what you did to clean the dial? I am servicing a 992b, and have the same dial marked "Railway Special." Yours looks great - a definite improvement by 100 percent! Also, I'm pretty sure this is painted enamel...another guy I know was saying 992b's also came with paper dials, but paper, I'm pretty sure, would be very obvious...mine is definitely painted on, for sure. Thanks for any help you might be able to provide me with. Best, Tim C.
Oops, sorry, I just realized yours does not say "Railway Special," I was looking at that picture from the advertisement. Still, mine does say it. Thanks. Tim C.
These dials are typically enamel dials... sort of like porcelain with enamel baked onto a metal substrate. They are fairly impervious to dirt and easy to clean with soap and watch. However, they are very easy to crack or chip and need to be handled with care. 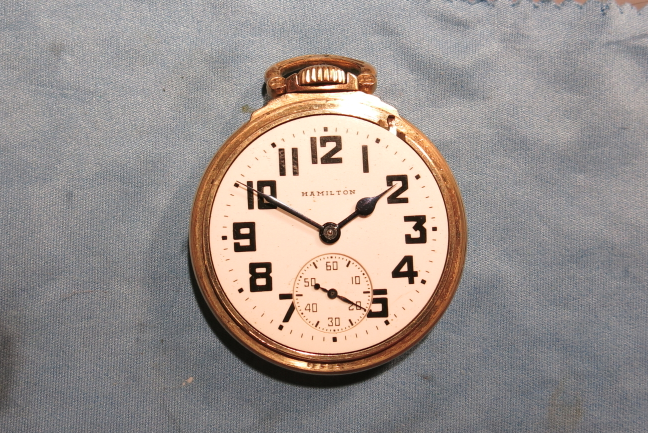 Hamilton pocket watches from the 1950's and later used a material called "enameline" which was a plastic rather than enamel. Enamaline didn't really hold up as well as enamel and it's not unusual to see enameling dials with severe spider-web cracking. I'm not aware of paper dials being original equipment but I wouldn't be surprised to see one as a replacement for the original enameline dial that failed. Hi, a good and kinda cheap way to clean a porcelain or enamel dial is to let it sit overnight in a glass of water with a denture cleaning tablet dissolved. Works wonders. In what year and what model had the flat face and beveled crystal? 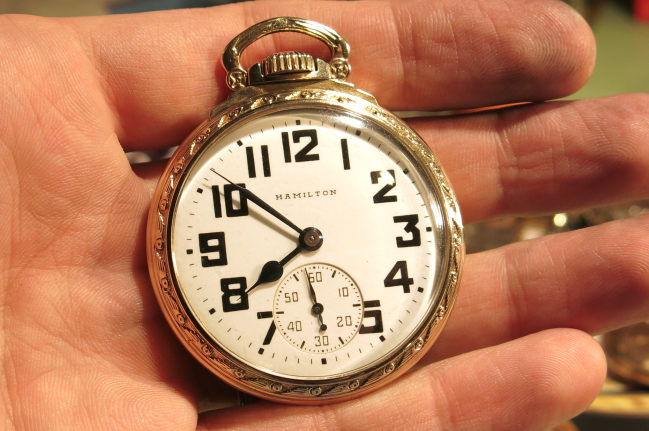 To the question, In what year and what model had the flat face and beveled crystal, I’m referring to the Hamilton Railroad Pocket Watch. I’m not sure what a “flat face” means and I don’t believe specific crystals were identified. 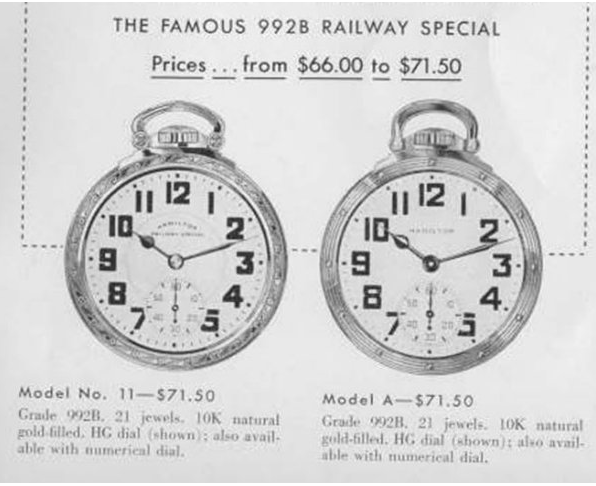 Also there are lots of Hamilton Railroad-approved pocket watches... the 992, 950, 940, et al. Many could be purchased uncased and the buyer selected a separate case when they bought it, presumably with a crystal of their choosing. I have a 992B with serial number C60759. Can you tell me when it was manufactured? 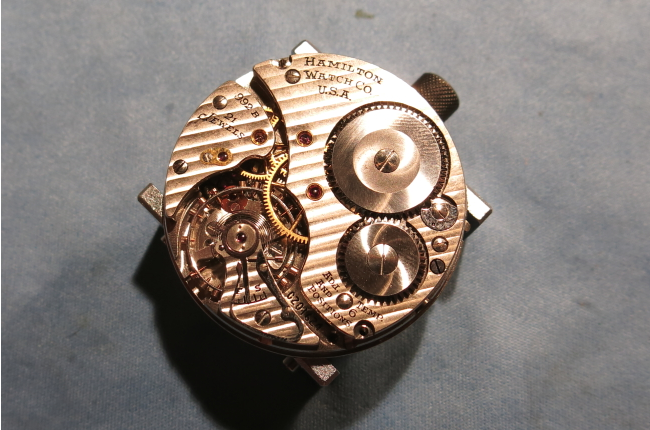 I've got 3 992s, a 1928 992, a 1937 992E and a mint 1952 992B in my collection of Hamilton watches and this is a great article with the teardown and overhaul. Thanks! Sweet! Now you need to add a 950 and 950B! Ha ha!